When you #RUNtoREMEMBER, we want to provide you with all of the resources possible for a successful race. 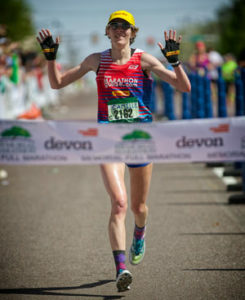 On this training page, you will find a Beginner’s Marathon Program developed by three-time OKC Memorial Marathon winner, world record holder and Oklahoma native, Camille Herron. This 16 week program is designed to start in January and lead you all the way up to Race Day. Are you looking to meet new friends in your area and train with runners practicing for a goal race in OKC? Well check out these groups below who are all looking for the same opportunities as you and start training today! Check out the opportunities below featuring the Oklahoma City Memorial Marathon or Half Marathon as their graduation race! Mountain Blast PowerAide and Vanilla, Chocolate, Tri-Berry, Salted Caramel and Strawberry Banana Gu will be available along the course. Where do you like to train? Use #RUNtoREMEMBER and share your training group with us if it’s not featured above!